Last week, I embarked on a different kind of adventure. There was still some uncertainty (will my plane arrive on time? ), some discomfort (sharing my bedroom with a tv, computer and the parents who use them) and some great rewards (Central Park in the quiet of the morning) and hugs and kisses from a cute boy. I flew to New York City mainly to visit my 2-year old nephew in Connecticut, but also to stay with my parents in Manhattan. Manhattan has a subtle type of beauty that does not appeal to everyone, but for a city and for people who love cities, it measures high up on the scale. 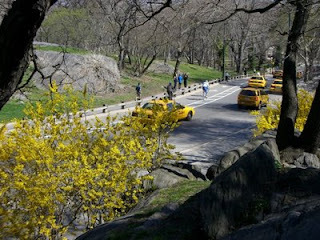 The yellow of the taxis juxtaposed with the black of the streets and dark buildings, the blooming flowers and trees in Central Park against tall, imposing towers and the way that everyone and everything is in motion as if composed by a great conductor- that is the appeal for me. 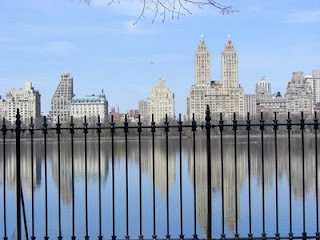 I spent time walking up to "Museum Mile" on the upper east side, then into Central Park where it was surprisingly quiet and in bloom, around the reservoir to the west side, to a deli with knishes and bagels and on a subway back to the apartment by the East River. 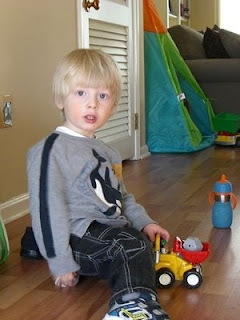 That afternoon, I spent time on the floor of my sister's apartment, playing with the dump truck I gifted to Andre, my nephew. It was only after I played with him that he allowed me a handshake, a kiss and then a hug. Everyone has their price! Although New York can be expensive (that bagel and knish set me back $14), crowded (Central Park throbbed with the masses on a sunny Saturday for those seeking an outdoor experience) and hectic (no strolling down a city street), its charm is in embracing all those things and, for me, being glad I don't live there and can go back to (comparatively) sedate Seattle.